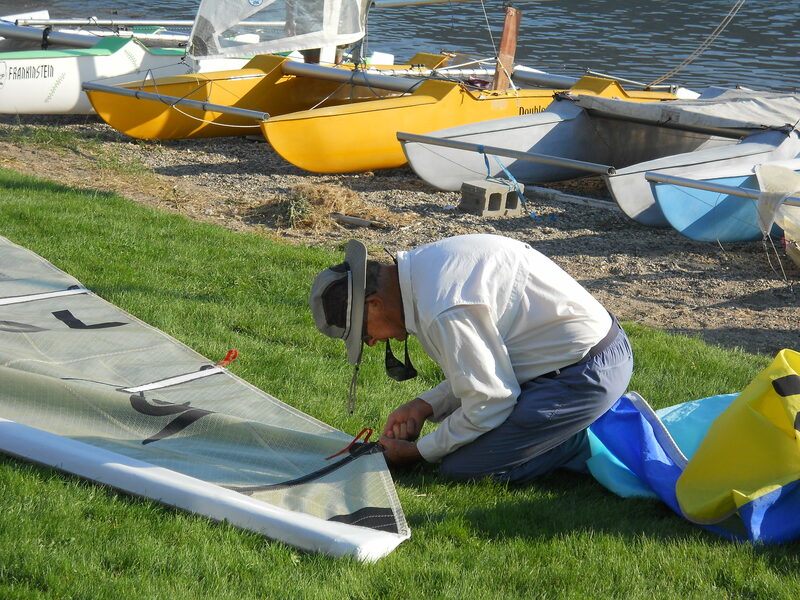 A Case for Sock Sails | Canadian SeaSpray Assn. I trust to sailmakers to do a good job. I have had great sails over the years put together by sailmakers: Bob and Mary Taylor(no longer in business), Tom Taylor, Jay Gardner, and North Sails of Vancouver. The latest sets I have purchased have been from North Sails of Vancouver and are Mylar. Usually I order one main and two jibs. By using an older set when sailing for fun I hope to make my latest two sets last a long long time on the racing scene. I have gone with the sock or sleeve style for a number of reasons. The rig is lighter! Mast with sock is @ 12 pounds less than the typical halyard rig. This is significant as you don’t have weight aloft which has to be dealt with when it blows. I don’t usually hike out very hard unless I feel particularly aggressive and it is blowing strong. The rig tends to bend a bit more! This seems to give a bit better sail shape which I think may be more effective and faster. It also depowers a bit in heavier gusts. The cost to fabricate a sock rig compared to the extruded halyard mast is much less expensive so (UPDATE: SEE ‘BUILDING A TUBE MAST FOR HALYARD SAILS) .. if you need to replace your halyard mast give it some thought. By the time I have bought or made the hounds, mast cap, base, boom goose neck, downhaul pulley and cleat arrangement, batten socket and tubing I am looking at less than $200.00 for materials. Note: The mast head has to fit the head of the sail if you want the sail to have optimum shape. I usually fabricate the head out of wood using waterproof glue. This can take quite a while to get a satisfactory fit. Finally the care of sails is something that really needs to be discussed. With the mylar sails that I have one set is close to fifteen years old. Still has good shape and is competitive. The secret: I carefully roll the main and jib together and store in a space that doesn’t crush them. The only visible wear is from the folds that the sails had when they were delivered. I also put them up, do my sailing and take them down immediately when done.